There are more than 40 species of fish that are known to be susceptible to VHS and huge die-offs of freshwater drum, muskellunge, round goby, gizzard shad, and other species have occurred in the Great Lakes. VHS can spread easily to the Northeastern United States through drainages off of the St. Lawrence River. There’s also the threat of VHS making it to the Mississippi River and be able to spread out from the system channels. 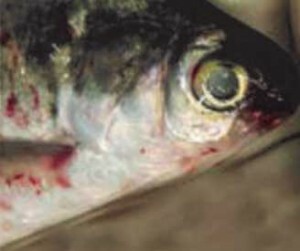 Fish will show widespread hemorrhages (bleeding) throughout body surface; eye, skin and fins and within the internal organs such as swim bladder, intestine, and kidney. 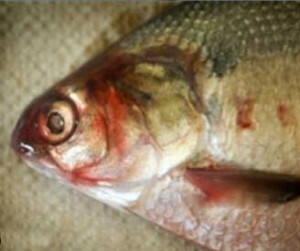 Sick fish will usually swim in circles and frequently be at the surface of the water. Confirming VHS infection requires sophisticated laboratory testing. 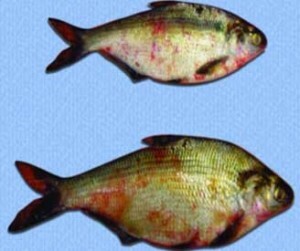 A diagnosis can’t be made based only on observation because many different diseases of fish have very similar symptoms. VHS is not currently found in Nebraska. The Great Lakes strain of VHS most likely originated from the Atlantic coast of North America, specifically the Maritime Provinces of Canada. Different strains of VHS are native to Europe, Japan, and the Pacific; California to Alaska and North Atlantic coasts of North America.